Barbara Baird describes what Memorial Day means to her and her family after the loss of a boy they love. My boys knew their boy. They were college fraternity brothers together. And then, the word came. Josh was gone. Killed by an IED in Afghanistan while serving in the Army. My grown sons who had known Josh so well came back home, with heavy hearts and a sadness that I still see in them today whenever we talk about Josh. And they drove over to Illinois to say goodbye and to stand tall with others along the little town’s main road – where local firefighters and motorcycle riders and every farmer from miles around came out to pay their respects and to thank Josh’s family for his service. Later, it came time for the dedication service of a new lounge at the ROTC department where Josh went to college, and I took my camera and notepad to cover it for the local paper. And I couldn’t do it. I could not snap photos of the family at the dedication service, as Josh’s father sat and tears streamed down his face while the ROTC commander talked about Josh and what he meant to those who knew him. I could not photograph this incredible personal sadness. It was mine, too. I watched from the sidelines as my own son stood at attention with the same ROTC unit that Josh once called his own. Then, I met Josh’s mom. She and I bonded because our boys bonded. I told her, “You know, my boys loved your boy.” And we hugged and agreed to see each other again soon. We have developed a friendship — not only she and I, but also Josh’s dad and my husband, too. We are four friends now who meet occasionally for dinner and politics. But you know what? 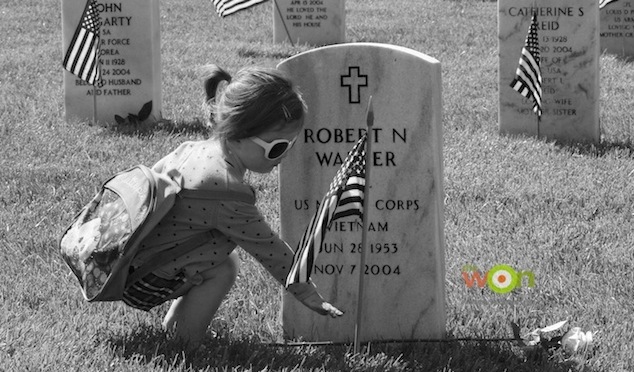 I love that boy, too, and all the girls and boys who have gone before him and since come home in a coffin draped with a flag and sacrificed all for us. How can you not love someone who was willing to give you the ultimate gift? When we go outside to Memorial Day parades and barbecues and ball games, let’s remember how much we love those other people’s kids. And why. Well done and amen.I completely understand your feelings of not being able to truly”cover” the memorial service. I had to tell the paper I work for I simply couldn’t do those stories. Just hit to close to home when you have a child that has spent 10 of his 14 years in the military at war and in harms way.